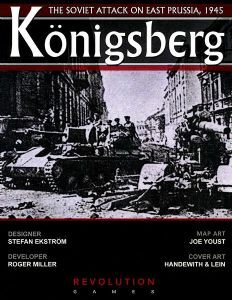 Konigsberg: The Soviet Attack on East Prussia, 1945 simulates the Soviet Attack by the 2nd and 3rd Belorussian Fronts on elements of Army Group Center in January, 1945. Each corps and army is represented by an activation chit and each side has a limited number of activation's they can use in a turn. This leads to players uncertain as to when or if formations will move or fight when they want. The Soviets offensive is mobile but quickly out paces its infantry and HQ's, random events can ground the Soviet Air Force or Stalin may intervene and delay some formations. The Germans units get hit hard and each move is critical to blocking the Soviets from the critical cities of Elbing and Konigsberg. Your motorized formations can be hit by no gas or the Gross Deutchland could withdraw when you need these units to defend a critical location. 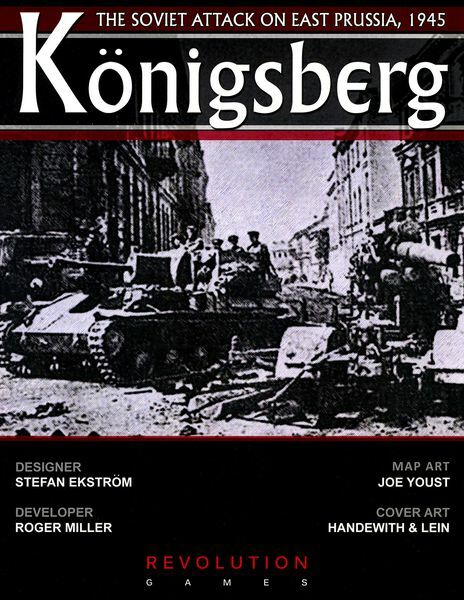 Can you replicate the epic defense of Konigsberg or will the Soviet onslaught win the day? Note Players will need to provide one 6-sided die and one container with which to draw out Command & Activation chits. Across The Narva: The Soviet Assault on Estonia, February 1944 simulates the continuation of the Leningrad–Novgorod Offensive of January 1944, the Soviet Estonian operation pushed the front westward to the Narva River, aiming to thrust deep into Estonia.